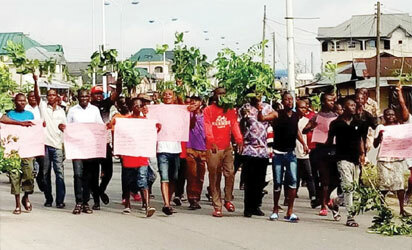 Villagers in a community in Delta state have protested, giving a Catholic church a 2-week ultimatum to quit their land. According to a report by Vanguard, the people of Ekuigbo community, Ughelli North Local Government Area, Delta State have issued a 14-day ultimatum to the Catholic Church to quit their land if it does not want the Delta State Government to operate Saint Theresa Grammar School in the community. In fact, new students were to resume for the new academic session in September, but a tussle broke out over the ownership between the church and the ministry. “The community did not sell the land to the Catholic mission but rather, the land was only leased to them and the ownership claim of the mission is erroneous,” he asserted. Director of Communication of the Warri Diocese, Rev. Fr. Benedict Ukutegbe and the Catholic Dean/Vicar of Ughelli, Rev. Fr. Godwin Orudje, declined comments when contacted. Findings by NDV showed that the school with two sites was operated by the state government before it was reportedly handed back to the Catholic Mission together with 26 other schools in 2011 by the Delta state government under the administration of former governor, Dr. Emmanuel Uduaghan. An official of the Warri diocese, who preferred anonymity, told NDV that the state government did not formally takeover the operation of the school from the church. “You would agree with me that in 2011, 27 out of 40 schools were handed back to the Catholic Church, including St. Theresa’s Grammar School. “But in this case, the Delta State government attempted to take over the operation of the school in one of the sites after giving it to the church and wants to run it exclusively without the input of the church, and we feel this is wrong, so that is actually the crux of the matter,” he added. Government awarded a contract for the renovation and upgrading of the second site of the school, now known as Government Model Secondary School, Ekuigbo. From available information, the school was to resume the 2018 academic session, September 17, on completion of the building project and teachers under the State Education Board had been transferred to the school. Students who passed the entrance examination as conducted by the state education authority had completed their registration pending the resumption until the confusion set in with the Catholic Mission claiming ownership of the school under its missionary services. Not to miss the 2018 academic session, parents of the admitted students had to re-enlist their wards at other available schools.